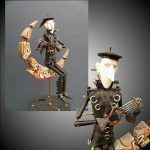 A Steampunk version of a 19th century automata. The dead moon appears to be made of graffiti covered concrete. This is the first time that Keith has used a music box mechanism. Height 39 cm Width 18 cm £1,750 To view a video of the piece or purchase it please visit our online store. Our Mechanics Alive!! exhibition is making a brief appearance (for two school weeks) at Oakham School Smallbone Library Foyer, in Rutland, Leceistershire, before heading off on tour to Australia for a year.